The ecommerce term also refers to online stock, bond transactions, buying and downloading software without ever going to a store. In addition, Ecommerce includes business-to-business connections that make purchasing easier for big corporations. Basically the method of buying and selling products and services electronically is called ecommerce. Make changes in template as you want. There are unlimited categories in ecommerce to shop according to your desired requirement. There are unlimited products can be shopped, according to your need. 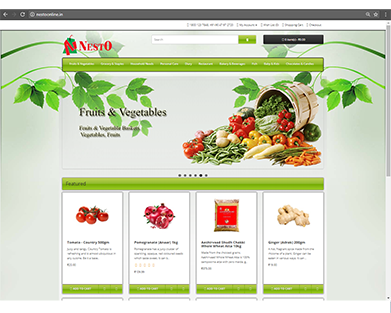 Ecommerce website is available in many languages, it can be used by throughout the world. Payment can be made from anywhere in world, because it has a special feature of currency convertor. Download your desired products for your use. Rate the products as you like them after experiencing them. Image gets resize automatically to give you enlarge view of product, so that it will be visible to you properly. Zoom product image for detail view. Multiple tax rates can be setup based on Geographical Area. There are unlimited informative pages which can be helpful to you for choosing the product correctly. This feature gives you the weight of the product that you have chosen. There are discount coupon system also for your convenient shopping. Ecommerce have SEO (search engine optimization) structure, so that you can easily search your desired products. You can take backup of any product you have selected, which gives you all the details of product. You can get invoice printed with all the details. Sales Reports help you track your sales performance so you can measure your existing business against sales goals. There is a feature from which you can export & import your selected product to anywhere in world. You can get multiple stores also, for shopping and get lots more. There are many options for payment of your products.